Dermatology Specialists of Illinois (Algonquin) - Book Appointment Online! At Dermatology Specialists of Illinois , we are committed to the advanced treatment of skin conditions and diseases. 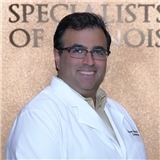 Dr. Vic Khanna and staff are the answer to all of your medical, surgical and cosmetic dermatology needs. We treat patients of all ages. Dr. Khanna certified by the American board of Dermatology and specializes in Cosmetic Dermatology, Dermatologic Surgery, Dermatopathology, Hair Disorders, Medical Dermatology, Nail Disorders, Pediatric Dermatology, and Skin of color. If you are troubled by new or chronic skin conditions or would like to learn more about our services, procedures and/or products please give us a call at 847-458-SKIN and we will be able to better assist you.